This is the stuff of dreams and unicorn tears when Volkswagen places 400 horsepower on paper for a new Golf (GTI?). I can actually remember a time when tuners and my meticulous VW friends set-out to build a GTI to 400 horsepower find some quattro all-wheel-drive system to bolt to it hoping that it would all stay together for a few rows through all forward manual gears. 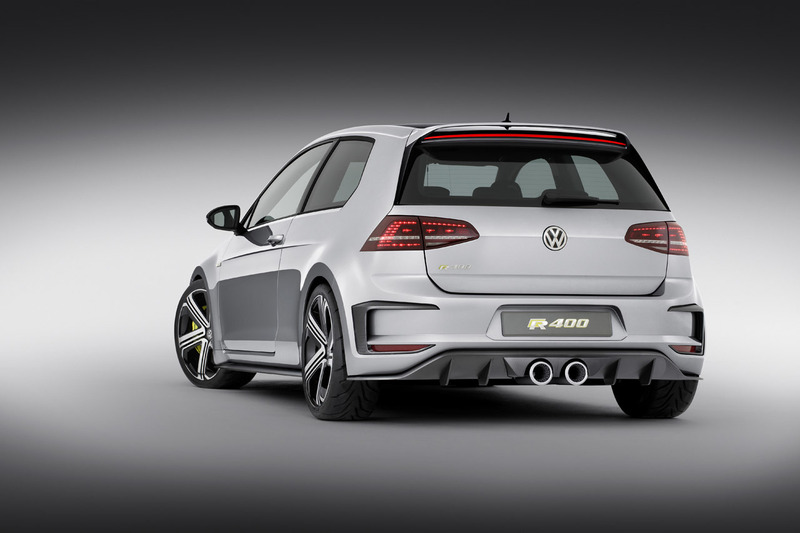 Today, it seems VW pulled out the old enthusiast book of “wants” and decided to finally make the dreams of many come true in the form of a Golf R 400 Concept that packs in 395 horsepower and 332 pound-feet of torque from their ‘old’ 2.0-liter turbo 4-cylinder. The new Golf R 400 Concept here is said to reach a top speed of 174 mph and reach 62 mph in 3.9 seconds. This all sounds perfect to us… just we now want some type of confirmation of Volkswagen actually building this thing and having it land on our shores here in the states. Let’s keep our fingers crossed on this one because I know you want one – so do I! 2. 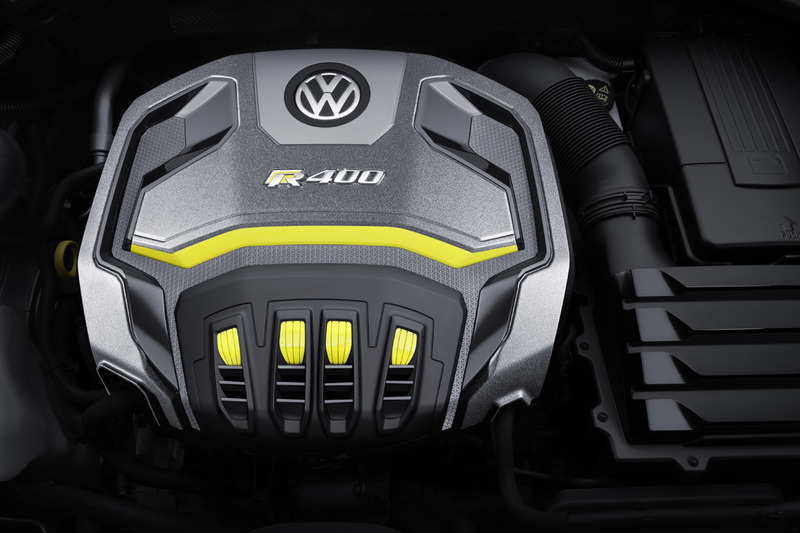 The “400” in Golf R 400 stands for its power of 400 PS. 9. Permanent 4MOTION all-wheel drive impressively transfers the car’s extraordinary power to the road. Wolfsburg / Beijing, April 2014. 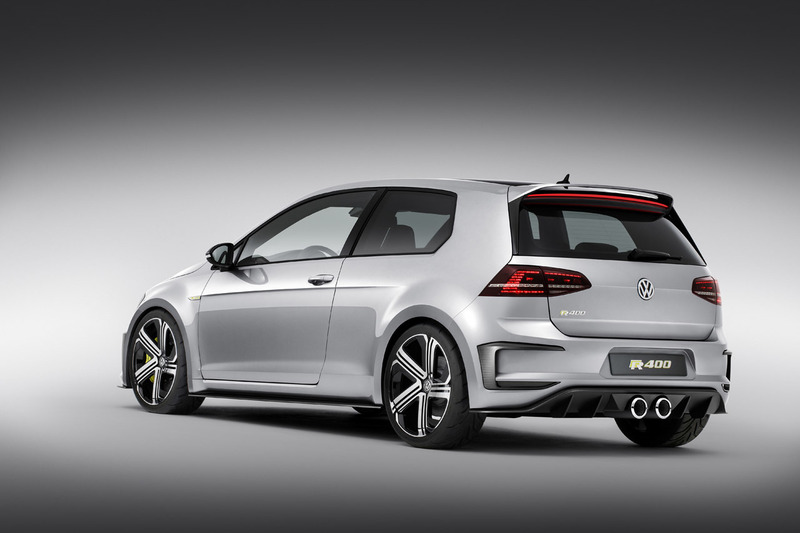 The latest Golf R production model was introduced just recently. With 221 kW / 300 PS of power. All-wheel drive. It handles the sprint to 100 km/h in 4.9 seconds and attains a top speed of 250 km/h (governed) – this is the sharpest production Golf ever and one of the most agile sports cars in its class. But the potential of the Golf – which made its debut exactly 40 years ago and developed into one of the world’s most successful cars – enables even further extensions to the limits of what is feasible in sporty performance. Volkswagen is demonstrating at Auto China 2014 just how far these limits can (currently) be extended in the world premiere of the Golf R 400 concept car. Its name reflects its mission. It is a Golf developed by Volkswagen R GmbH – the brand’s sports car manufacturer. 400 stands for 400 PS (294 kW). The powerful engine with the genes of the WRC racing version propels the Golf to 100 km/h in 3.9 seconds. Its top speed, assuming that a German motorway or race course is available: 280 km/h (governed). 200 PS per litre displacement. The Golf R 400 is powered by a 2.0 TSI with the technical genes of the WRC racing engine. Compared to the 221 kW / 300 PS Golf R, the Golf R 400 develops 100 PS more power, thus providing 295 kW / 400 PS (at 7,200 rpm) – which is 200 PS per litre of engine displacement. This specific power figure lies on the same level as that of super sports cars. The engine’s maximum torque was increased by 70 Newton metres to 450 Newton metres (between 2,400 and 6,000 rpm). EDS, XDS, ESC Sport. Along with the Haldex coupling, which acts as a central differential lock, the electronic differential locks (EDS) integrated in the Electronic Stability Control (ESC) system act as transverse differential locks. In addition, the Golf R 400 is equipped with the XDS+ system on both the front and rear axles, which brakes the wheels at the inside of a bend during fast driving through bends, and which optimises steering response as a transverse differential lock. Last but not least, the Golf R 400 has an “ESC Sport” function like that of the production model. The system is activated via a two-stage switch on the centre console. When the driver presses the button once briefly, this selects the “ESC Sport” mode of Electronic Stability Control (ESC). During very fast driving with lots of bends – e.g. on a race course – the ESC does not intervene as frequently, which enables even more agile handling properties. If the ESC button is held down more than three seconds, the system is fully deactivated for professional drivers on a race course. Sport suspension and new wheels. The sport suspension of the production Golf R, which lowers the ride height by 20 mm compared to the base Golf, did not have to be changed for the Golf R 400 thanks to its large power reserve. In front, the two Golf R versions each have a MacPherson-type suspension with lower wishbones, while what is known as the modular performance suspension (multi-link suspension) is used at the rear. The tyres are also the same on both cars: 235/35 R 19. 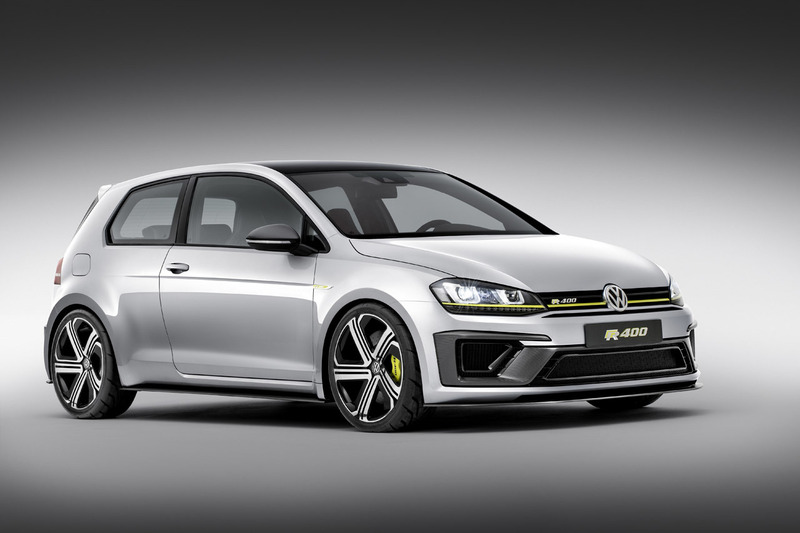 The alloy wheels of the Golf R 400 are a new development. Their design is based on the 19-inch “Cadiz” production wheels, but they were highly modified and equipped with high-gloss black inserts which, as air vanes, perfect cooling in the reinforced brake system. Front end. 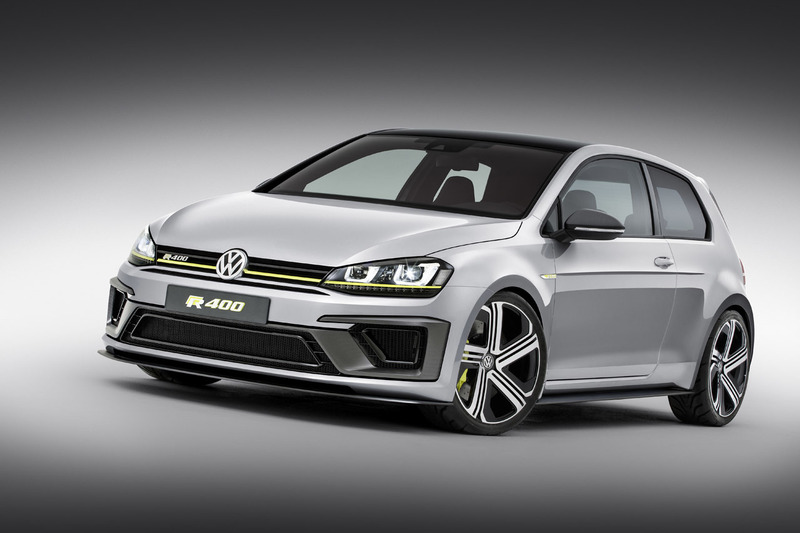 Designers have redesigned the front end of the Golf R 400 as well. 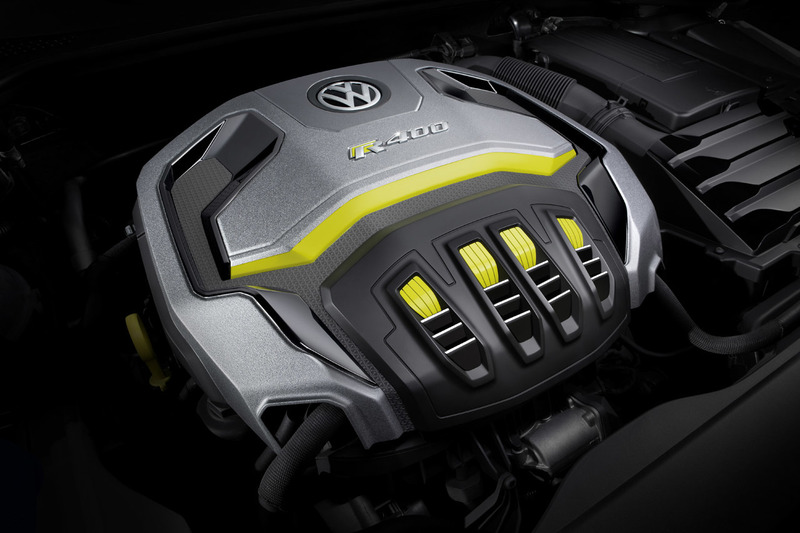 Beneath the high-gloss black radiator grille with its “R badge”, on a background in “Lemon Yellow”, the Golf R 400 also features a line in “Lemon Yellow”. Similar to the line of the Golf R (chrome line), Golf GTI (red line) and the new Golf GTE (blue line), it forms the termination of the grille towards the rear and continues into the headlights on the left and right. Beneath this line, there is a type of slot that serves as an air inlet on the Golf R 400 to help cover the car’s elevated cooling requirements. The bumper was also completely redesigned. The central air inlets have a surround that is a wing-like element made of carbon effect, which visually appear to hover in the bumper. The lines of this aerodynamic element run horizontally up to the height of the bi-xenon headlights, then they bend in a V-shape towards the rear, and finally describe the form of a C (left) and a reversed C (right). Self-contained wing elements in high-gloss black also hover in the lower air inlets. Between the aerodynamic element of visual carbon and the high-gloss black wings (as well as within these black elements) there is a protective screen whose honeycomb structure – like so many details of the Golf R 400 – is reminiscent of motorsport vehicles. Since the wing element protrudes somewhat further forward, this gives it a progressive three-dimensional appearance. As in the side profile, there is also a motorsport-derived splitter in carbon effect at the front. Dual rear spoiler design. The black roof transitions into a roof spoiler that is also in black. It has two levels: viewed from the rear, the gaze is directed through the two “flying” spoilers, one above the other, to the roof. Designers have integrated an LED brake light bar in the rear spoiler. Shell seats in Alcantara and carbon leather. 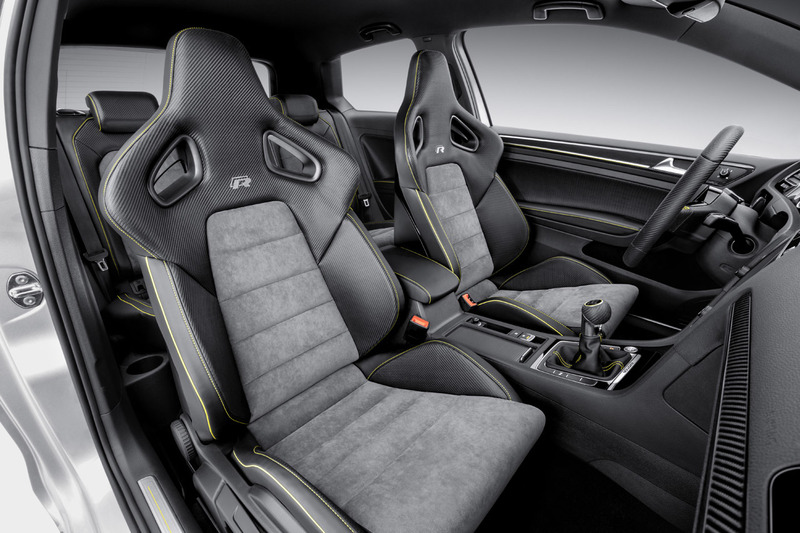 The interior of the Golf R 400 has also been extensively customised. The driver and front passenger have motorsport shell seats with integrated head restraints and belt openings. The cross-quilted middle seat panels are designed in Alcantara (“Anthracite” colour); the areas at head level and the inner surfaces of the lateral supports are designed in exclusive “carbon leather”. The same applies to the outer side of the shell seats. The decorative stitching and stitch tucks (contrasting seams on lateral supports) create a contrast to the fresh “Lemon Yellow” colour. “R” badges are embroidered in the leather on the backs of the front seats. The rear individual seats are also designed in “carbon leather” on their outer areas, and the inner surfaces are upholstered in Alcantara. The area between the two seats is trimmed in black “Nappa leather”. Carbon accents. Carbon is also the dominant material for accents in the doors and on the passenger’s side of the dashboard – in contrast to the exterior, however, it is coated here in a glossy rather than matt clearcoat. The centre console accents, cockpit surround and trim around the air nozzles are designed in glossy black piano finish. Carbon leather is used for the door inserts. The door armrests, meanwhile, have contrasting stitching in “Lemon Yellow”. There is white ambience lighting around the door accents and the stainless steel door sill plates. Carbon leather is used in the “R” design of the three-spoke sport leather steering wheel. All leather elements are also customised by decorative stitching in the contrasting colour “Lemon Yellow” – perfection down to the smallest of details.